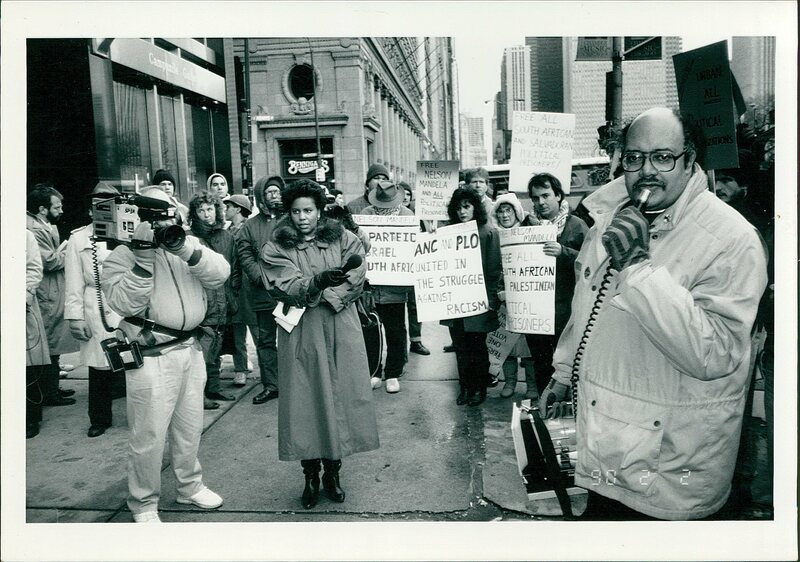 Demonstration in front of the South African Consulate at 200 South Michigan Avenue, Chicago protesting the South African Apartheid regime and also the Israeli government's treatment of the Palestinians and in support of the ANC (African National Congress) and the PLO (Palestine Liberation Organization). This demonstration was held a little more than one week before Mandela was released from Victor Verster Prison. Signs in demonstration read, "ANC and PLO: United in the Struggle Against Racism," "Apartheid, Israel, South Africa," "Free Nelson Mandela and ALL Political Prisoners," and "Free Nelson Mandela - Free All South African and Palestinian Political Prisoners." Basil Clunie, in right front of photo, is holding a microphone and portable loudspeaker. Used by permission of Kathleen M. Devine.